Capt. William E. Simpson II – USMM Ret. contributed the following article to Healthy Forests, Healthy Communities. Wild horses are the life-blood of American history and tradition beginning with Native Americans in the pre-Columbian period and extending thereafter. They are the majestic symbols of the strength and freedom that resonates at the core of America. There are more than 100-million horse lovers in America today that support a flourishing $122-billion annual industry. All horses in the world today, including the hundreds of domestic breeds evolved and originated from the original genetic lines of North American native species wild horses. This may be far more important than just a historical fact given that a myriad of genetic defects have been generated by inbreeding in domestic breeds for desired traits and morphology; genetic defects are now endemic in many domestic horse breeds. American wild horses may harbor the remaining genetic vigor of entire Equine species, which may allow the option of outbreeding and breeding-back to these more robust native hybrid gene-lines, thereby offering some remediation of this growing problem. In the millennia prior to 17,000 years ago horses did not exist in Europe, Africa or Asia. However, it is estimated that sometime around 17,000 years ago North American wild horses began crossing the Aleutian land bridge into Asia and thereafter spread to Africa and Europe; the rest is history. Today as a result of selective breeding, there are hundreds of breeds of domesticated horses. Throughout millennia wild horses have existed in virtually every biome on the planet and have evolved symbiotic mutualisms within most ecosystems, including and importantly in and around forest ecosystems. Horse fossils (including the oldest fossils known) have been found across most of North American and they are literally and inseparably part of land. There is substantial paleontological, genetic and cultural archaeology that proves native species wild horses not only uniquely evolved in North America, but survived through the ice-age and through the pre-Columbian period and were used extensively by Native Americans for domestic uses, including hunting. Tens of millions of wild horses ran free across North America prior to the advent of the American civil war in 1861, after which their numbers began to plummet due to actions by mankind, including WW1 where over 1-million American horses were killed (8-million European horses), until finally in 1971 when the Wild Burro and Horse Protection Act was passed by Congress. In 1971 when the Act was passed, there were between fifty and one hundred and fifty thousand wild horses remaining in America. To put that into context, today the USDA says there are about 100-million head of cattle in America and well over 2-million are grazing public lands (http://dailypitchfork.org/wp-content/uploads/2015/11/BLM_USFS-grazing-analysis_2014_Daily-Pitchfork.pdf). The stark reality is that the entire wild horse population in America today is a tiny fraction (0.00107%) of all the cattle in America. It seems that some folks in the livestock industry and at the USFS & BLM will not be happy until wild horses are totally extinct. This is a most unreasonable and obtuse position given their intrinsic value as symbionts in and around forest ecosystems, where they have survived even the ice-age. 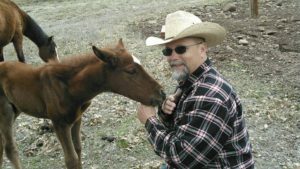 According to the noted paleontologist Dr. Ross MacPhee, the public is being intentionally misinformed through many media outlets via BLM canards, which also now includes the ‘wild horse overpopulation’ misrepresentation. Even on public lands that were set-aside for American wild horses protected under the 1971 Congressional Act, there are about 40 head of cattle to each horse! This is a fact according to a 2014 BLM-USFS grazing analysis. Arguably, today we have even fewer wild horses running free in America than when the Act to protect them was instituted by Congress back in 1971. The BLM capriciously and arbitrarily sets artificial levels for what they alone define as appropriate population levels for wild horses, also known as appropriate management levels or ‘AML’. These AMLs have nothing to do with ecology and wildlife management and everything to do with the economics of the livestock industry and politics. According to the BLM (if we are to trust them) there are about 67,000 wild horses running free. Some advocacy groups say the correct number is closer to only 30,000 wild horses. And another ca. 50,000 wild horses are being held captive in BLM and USFS corrals, where all of the stallions have been gelded, thus further depleting the genetic diversity of these American icons, while costing American taxpayers about $50-million/yr. Meanwhile, forests and watersheds in the western United States are being literally devastated at an accelerating rate by abnormal catastrophic wildfire as a result of the steep decline in western deer populations; another man-caused management debacle. In California and Oregon alone, the population decline over the past five decades amounts to more than two-million deer. Each deer that was present in and around forest and grassland ecosystems had consumed about 7-pounds of grass and brush per day. This is critically important in that these missing deer had been naturally abating several millions of tons of grass and brush annually from the areas in and around our forests, thereby mitigating deadly wildfire ground fuels. These millions of tons of now excessive grass and brush are the super-hot burning fuel that create and support abnormal catastrophic wildfire. This important relationship between the deer and the forests has been totally overlooked by many foresters and forest scientists, who are the primary source of information to elected officials and politicians. This result in a deadly gap of information. Even though forest stewardship though logging has obvious economic advantages and provides improved forest access for management via quality roads, the removal and or thinning of trees, dead or alive, does not change a fire regime that is fueled and driven by grass and brush ground fuels. This was the horrible lesson-learned in Sonoma and other California counties stricken by catastrophic wildfires fueled by grass and brush in 2017. A warmer climate merely provides longer summer seasons and optimal conditions for these fuels to ignite. Further evidence of the ‘grass and brush’ wildfire paradigm is seen by way of the large burn scars that are now devoid of trees (trees previously destroyed by wildfire), which nevertheless are the breeding grounds of regularly occurring catastrophic wildfires fueled by the un-grazed annually recurring grass and brush on burn scars in and around our forests. In some cases these burn scars over five-hundred thousand acres in size. Wild horses can help save our forests and watersheds. 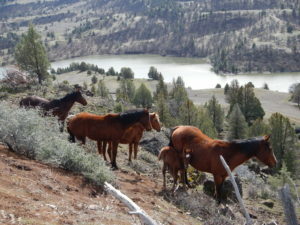 The ~50,000 wild horses sitting in the BLM/USFS corrals costing taxpayers $50-M annually can be legally deployed into and around carefully selected forests where they will naturally abate the ground fuels at the rate of 1.5 million pounds per day, or about 274,000 tons of grass and brush annually. The value of this annual fuel abatement service in minimally hundreds of $-millions of dollars. In total, the concept is known as the Wild Horse Fire Brigade.